Audi lowered the Q3's body by 25 mm (0.98 inches) for the RS Q3 concept and added details such as a tweaked grille with honeycombs slightly offset to create a 3-D effect and a silver quattro signature on the lower part. Audi will unveil the RS Q3, a high-performance concept vehicle based on its Q3 compact SUV, at the upcoming Beijing auto show. Audi said public reaction will determine whether it builds the concept, which would be the first time it has applied its RS performance badge to an SUV. The concept uses the same 2.5-liter turbocharged gasoline engine as the A3 RS and the TT RS, with a seven-speed S tronic transmission. The five-cylinder engine produces 360 hp and accelerates to 100 km/h (62 mph) in 5.2 seconds. The concept has a top speed of 265 km/h (165 mph). 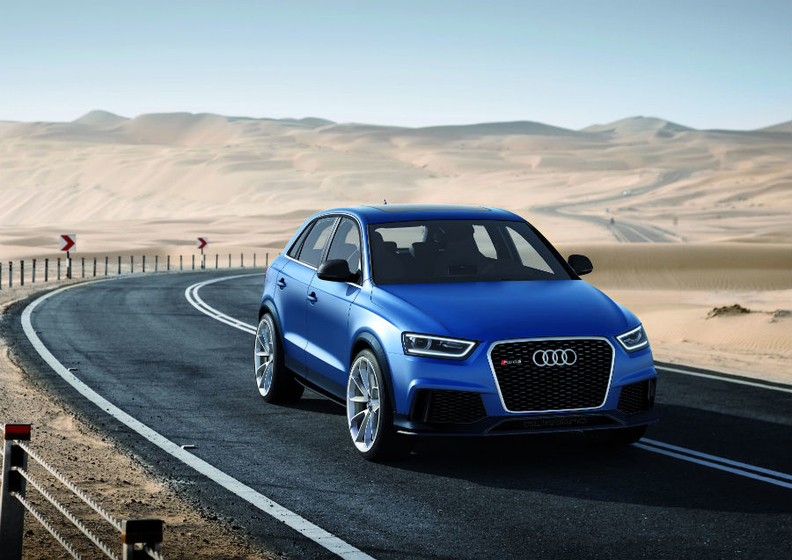 Audi said it created the RS Q3 because China is an important market for SUVs, but the carmaker will seek reaction to the concept from global markets before deciding whether to build the car. "We're looking to gauge world opinion," an Audi spokesman said. "Concepts have more global significance than local significance. It wouldn't be sufficient for one market only to say they liked it." China is Audi's biggest single market. The brand posted its best-ever first-quarter sales in the country, up 40.5 percent to 90,063 units from the same period in 2011. Global sales rose 10.8 percent to 346,100 for the quarter. SUV sales in China hit just over two million last year, with analysts IHS Automotive predicting the will reach four million by 2014.